Twirl and dip at the Planes of Fame Air Museum. The World War II Hangar Dance kicks it up at the Planes of Fame Air Museum in Chino on Saturday, March 28. THOSE ICONIC OPENING NOTES: Hearing a 75-year-old song isn't too unusual, but it is where we hear it that sets the stage of emotions. Take Glenn Miller's "In the Mood." The swing-tastic, dun-dun-dun-delightful Big Band ditty is recognized from its very first notes, three quarters of a century on, but we only ever seem to hear those notes played in movies and commercials and the occasional radio station. Enjoying them as people did in the late 1930s and early '40s, on a dance floor, is a much rarer pleasure, as is dancing to the tunes much associated with the first half of the 1940s. Being able to don the duds of the World War II era -- dresses with cinched waists, neat ties for men -- and move to the music of the time does happen on occasion, and sometimes, in quite the era-specific setting. 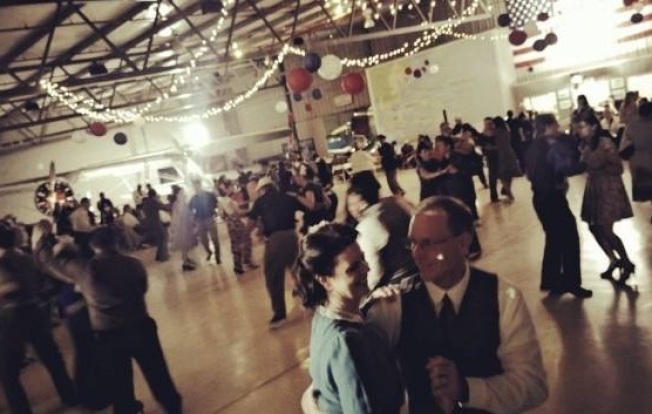 HISTORY ALL AROUND YOU: That will be the case when the second annual World War II Hangar Dance sways into the Planes of Fame Air Museum in Chino on Saturday, March 28. The "Hangar" part of the name is a giveaway that this shindig is not happening in a community center or traditional hall; it actually taps a foot feet away from "the many displays of aeronautic history among the warbirds collection at Planes of Fame Museum." You may attend many a dance in your lifetime -- and you absolutely should, what with dance serving as a fine way to ease stress and help health, oodles of studies show -- but you'll rarely dip and twirl in a space as distinctive. ON THE STAGE: The Fabulous Esquires Big Band'll provide the top-tapping tuneage and food'll be for sale, too. As for the part you play? You can absolutely dress up in togs of the '40s, straight down to your seamed stockings or shiny wingtips, but period-specific dress is not mandatory. If you have a vintage vehicle, you can also drive it to Chino for admiring lookie-loos to fawn over. There's info on that. Tickets? They're thirty bucks at the door.